I cannot remember how many times my sisters and I asked our parents if we could have a dog. Eventually they gave in and Lottie, a golden cocker spaniel, arrived and really became my sister Lucy’s dog. Lottie had many adventures chasing squirrels and pigeons in Hyde Park with Lucy flying off in hot pursuit and eating picnics (not ours) in Kensington Gardens, utterly impervious to our mother’s frantic calling of her name which the entire of the Park must have heard. I have continued the tradition today and still have a spaniel or two. They still fly off in happy pursuit of life but are quite good at returning and even sort of walk to heel. However, I also have Labradors, the first of which I bought when my son was two years old from a dear friend, Jo, who lives across a few fields. I hoped they could go grow up together and indeed he was a great family dog. Now, his daughter Bella is well over 12 years old, a bit creaky and slow but infinitely precious. She has a dignity and intelligence that needs little more than a look to pass between us and, if I say off to bed, she heads for the stairs, although these days she sometimes needs a little help getting up them. Bella adores Karine, another friend of mine who owns Bella’s daughter Finse, and likes to go and see her for a little bit of TLC. Rather wonderfully, Jo now has one of Bella’s puppies Molly so I have returned the favour. Other girlfriends have other puppies. Whilst Karine and I are already related through one generation of our dogs, Finse too has had puppies so the bonds are ever strengthened. Needless to say, not all the puppies are leaving Highclere. Labradors adore water and whatever the weather can never resist lying in muddy puddles or rushing headfirst into a pond or lake. They actually have webbed feet and a coat which just lets the water slide off, although the inside of your car may retain the smell of their love of water. Part of their breeding heritage is the St John’s Water dog from Newfoundland Canada, a vast rugged coastal province. This was brought back to England and crossed and bred by two Englishmen to become the Labrador we know today, although still so named in honour of their Canadian home. They are wonderful family dogs, loving our company, looking for direction and appreciation and, given their love of food as well as people, very trainable. They are trained as guide dogs and police dogs and even to warn of epilepsy and to research suggested cancer too. Above all, though, they are amazing family dogs. They are always loving and reassuring. Recently Karine and I have been visiting a very ill mutual friend, taking beloved Finse along too, for those last few glimpses of life. They are wholly non–judgemental but give life and smiles. 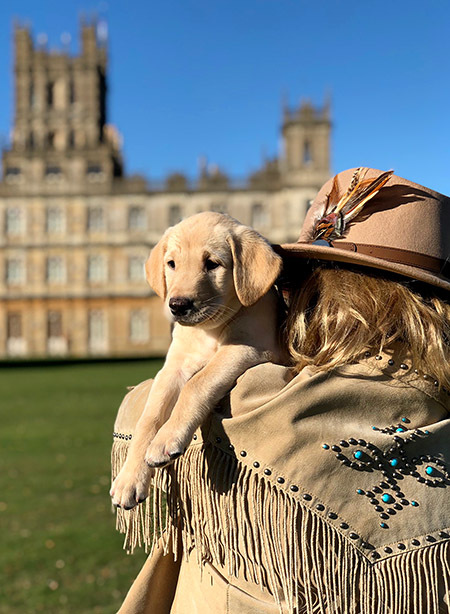 We thought we might take a puppy or two to the Harvest Festival Service here at Highclere next weekend golden puppies at a golden time of year. The puppies give so much pleasure, growing every day, trying new tricks, climbing new mountains and chewing more shoes. Some of them are now beginning their lives with new families and will give their love and very surely be given it in return. I LOVE CATS AND DOGS,BUT AT THE MOMENT I HAVE TO CATS AND ITS NAME IS XINHO AND FARRAPINHO. FARRAPINHO IS SIAMESE AND XINHO IS BLACK AND IS WITHOUT RACE. AGAIN I WILL DO THE SAME QUESTION IN HIGHCLERE ARE CATS?? Our chef Paul does have a lovely cat but we feel we have quite enough on our hands with just our labradors and spaniels. She is so adorable and quite adventurous. From one dog lover to another, how wonderful to see our ‘best friends’ featured in your email to me! As always, love your blog and the gorgeous photos!! You are so beautiful and your love of your precious animals is quickly determined when one reads the stories you write about them. Thank you once again for sharing hearth, home and your sweet, sweet dogs in us. Ahhh, nothing like puppy love to brighten the day. I am fostering a older pup myself right now named Prim, and she is a beautiful medium-sized solid coal-black mixed breed dog, with a decent amount of Labrador in her, I think. She is also a chewing machine and her nickname is ‘Shark’! Still dealing with some puppy teeth so the urge to chew is ferocious. My daughter and I are enjoying her puppy playfulness and companionship, but I have to admit, the vigilance and guidance required are like dealing with a human toddler ‘pup’. Some days I have to be very conscious about being puppy-positive! However, I know when the time comes for Prim to go to her forever family, we will miss her. I always love reading about the variety of animals you have in your life, and the special place in your heart for your dogs. Thanks for the delightful pictures and commentary that includes the latest generation of your fur-babies. All the best from Summerville, SC, USA. Have a great week! Thank you. Puppies are a lot of work but they give us so much back in terms of love, devotion and laughter that it is worth the effort. We had a black Labrador named Ruff. He loved to jump in the creek behind our house and we had to rinse him every time because he smelled awful. He loved playing with his Frisbee but unfortunately he developed hip dysplasia and the vet told us that he shouldn’t tried to jump and catch his Frisbee anymore. That was a sad day for all of us. Our Bella has become quite creaky in her old age, but she is still the sweetest natured girl. Our first family dog was a blonde cocker spaniel, Taffy. She was a larger size, as the breed seemed to be a bit bigger in the early 60’s than it is now. So spaniels have always been my favourite although we switched to Springers when our children were young. But many other family members had labs, and many Chesapeakes outnumbered our gang. I remember when Charles and Diana were married and we were all up early to watch the event together and all the Chesapeakes had the best seats. We had to sit on the floor! I fell in love with your Evie instantly when we visited a few weeks ago. Enjoy your “puppies, etc. service”, the Highclere church is beautiful. Thank you, it is a beautiful church and I really enjoy the Harvest Festival service each year. How incredibly wonderful are these photos and stories. 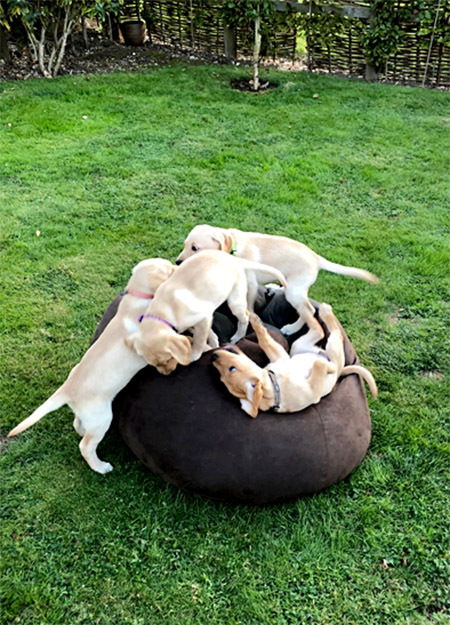 Young pups full of joy and mischief growing into loving, intelligent, loyal adults. Growing up, my parents bought a Newfoundland, which I believe is a breed related to the Labradour. Our “ Newfie” had webbed feet and a water resistant coat. Historically, these dogs were brought on whaling ships to help with rescues if anyone went over- board. He was huge in size with a gentle loving personality. My father loved to sail, and named him Barney, after Barnacle Bill the Sailor. Barney attempted to join many picnics and cookouts in the summer, often grabbing a morsel and running off! Our family pets are like siblings and children and leave precious memories. Your puppies and adult dogs are gorgeous- I’m sure you miss the pups but knowing they have wonderful homes makes it all worthwhile. I so look forward to your posts- thank you!! I love puppies! The post title is so true. I’ve had the pleasure of knowing a few Labradors. The only problem is, they missed the word “Great” when naming the breed. Being related to friends through the generations of dogs is a lovely thought to ponder! It is such a lovely way to share friendship. We have a puppy party every year when we all come together and celebrate our friendship with humans and canines alike. Another wonderful blog. I love the photo of you and Freya with the castle in the background. What a great shot! It is one of my favourites, taken by our son Edward. Dogs are so wonderful, they fill a home with such joy and love. Although I’m a golden retriever lover, so a fuzzier version of your labs, thank you for sharing your dog story. Aww, just gotta luv Freya! And what a “golden” photo: your golden jacket, your golden hat, your golden hair, golden Freya, golden Highclere, and a most wonderfully BLUE sky! Thank you for sharing pictures of the pups and hugs to ol’ Bella. 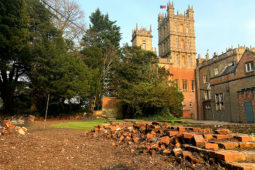 It is so nice on a Monday to stop by Highclere and read your lovely blog. Thank you – it was a glorious, golden day. I think that some dogs know MORE about what you are thinking, than you do! They can save you from danger because of there keen sense of awareness! A loyal dog can sense an earthquake, or a dangerous animal, when a dangerous storm is coming up behind you, he/she will always find a safe place for you and the dog to seek safety. And lets forget, if anything happens to you, a dog can get or find help for you. A never ending best friend with no back talk, but to just look into there eyes, you will see great sense of loyalty, and pride in ownership…..Mans Best friend!! You are right, they are such intuitive animals and give back to us in so many ways. Have a GREEEEEEEEEEEAT Day, AGAIN !!!! Such a lovely history to read this morning. You write so beautifully. I had a ginger colored cocker named “Ginger” when I was a child and have wonderful memories of her. Lovely to read about all your Labradors.They are wonderful dogs.Our dog Teddy was a Lab/Collie cross.He was one of the most intelligent,loveable dogs we ever had.He died 5 years ago aged 14.We still miss him very much. Just to say your dog Lottie must be very loveable.That’s my wife’s name,only she spells her name Lotty. Give your dogs a hug from us.And one for yourself too. Unfortunately I cannot have a dog due to allergies but I do so love the dogs that come along to my son’s rugby matches here in rural Lancashire.The Labradors are especially funny as they really do seem to sit and watch the match intently! Tilly the black lab has been known to climb up onto a fence and peer through whilst standing on her back legs – much to the amusement of the boys.All of the rugby dogs do very well snaffling up bacon and sausage from various rugby aunties (self included). Bacon and sausages – sounds like labrador heaven! Blessing of the Animals…..October….St. Francis of Assisi….Patron Saint of Animals…..
Could you possibly snap some shots of the event ? Would love to see. No doubt there will be plenty of photos of all the animals and I will be sure to share some of them. A dog is such a special being so it is no wonder so many humans refer to themselves in terms of being “parent” to their “fur babies”. They provide the unconditional love which I think we all need. As an only child, my dachshund, Duchess, was my confidante and cuddle-provider through many difficult years. Is there anything more endearing or giggle-producing as a roll on the ground with a littler of rollicking puppies?! You are spot on calling them “Bundles of Happiness”. Thank you for sharing. Good morning! It is with good reason that dogs are called man’s best friend. him home, feeding him and getting him warm. friends with our cat, grooming him and sleeping together. fond memories of our little Yorkie, Rusty. What a lucky little Yorkie to have found you and your husband. Now we have two Maltese who brought comfort to us all while at Richard’s father’s bedside last week as he slipped slowly away from us. We love your wonderful stories if you animals! They give us great comfort in sad times and share our happiest moments too. I heard this somewhere along the way; “Dogs are not our whole life, but they sure make our lives whole”. Thank you for reminding us of the love and devotion that can come from a furry creature with four legs. How do you decide what colour Labrador to get ? At least I have stayed with one colour so it sort of limits my inability to resist temptation fractionally….. Loved every word. Thank you. I hold lovely memories of four bouvier des Flanders and two rescue mixed variety fur persons, together with six cats and three children. All together. Precious times. I too am a Lab lover. I rescued my chocolate Lab to save the worthy life of an animal who ended up at no fault of her own in an unfortunate situation rather than electing to purchase through a breeder. You have an amazing platform from which to promote the wonderful reward of rescuing, and it truly is an endless reward from a grateful new companion who has a second chance of life. I hope your readers will consider this first before heading to a breeder. Thanks for sharing the beautiful pictures of the dogs at Highclere Castle. After having a houseful of dogs for several years, I am now down to one. My baby Bayou who was supposed to be my “grow old with” baby developed seizures one day, and within 48 hours I had to put him down. He wasn’t even 4. My old girl, Riley, was 14 when she left us, and now I just have Henry. Henry is 12 1/2 and getting slower and slower every day, but he’s always happy to see me, even if I just walked back into the room, and when he puts his head in my lap so I can rub his ears, it just makes my heart smile. Not looking forward to the day when we say goodbye – even the cats will miss him. Love your blog and the love you have for your animals, the history, and especially the people around you. Thanks for sharing this and all your great pictures of the dogs. I live alone in a smallish place where I can no longer have a dog. So I especially appreciate your comments about taking dogs on visits and “sharing them” in the park. You are certainly a wonderful canine advocate! Cheers! Soon after 2 children, we adopted into our family a blonde Cocker puppy, Tiffany, and a white kitten, Snowball. Tiffany would groom Snowball if he accidentally fell into the pool while the 2 were the best of friends lying side by side out on a lounge chair as they basked in the warmth of the sun during the winter months. How I loved my Cocker Spaniels! You are so blessed! Thanks, Lady Carnarvon, for sharing stories and photos. Cocker spaniels are so life enhancing! So sure that something even better in life lies just around the corner which means their concentration on training lasts at least 2 minutes!! Hello, I so enjoyed your post about your dogs. My husband and I have two West Highland Terriers, named Toby & Bailey. Our first Westie, named Shelby, died after being with us since birth at the age of 12. It broke our hearts, as neither one of us had ever had a family pet growing up. Just nine short months later, a friend told us about Toby & Bailey at our local “no-kill” shelter. We went & met them and as you can well imagine, they came to live with us that week. As you know, dogs are the loyalist family members we can have sometimes! All the best to you & your furry family! Literally as we speak, our 1 yr old Black lab is searching the house for our 7 yr old Red Heeler who is fighting for his life with liver failure… My dogs are my heart and right now my heart is broken – it seemed fitting that your post be about your dogs and the love and joy they bring. Actually when my husband, daughter and myself were visiting Highclere this past July, we had just missed seeing you and Bella! I’m sure the guides were taken aback a bit as I kept asking about your dogs, the dogs in photos, etc… and whether you might be back later so that I could possibly get to meet one or two of them, rather than questions about the Castle!!! I can’t help it…for me they bring beauty, calmness, and as you know especially with labs – endless hours of laughter with their zest for life in that moment! Thank you for sharing your stories, your home, and your dogs with us! Perhaps next time we visit, I’ll get that chance to meet you and your pups!!! I hope so – they are at the beginning of their lives and will I pray be here for many years! I have had two labs, and they are wonderful dogs. I love to see your dog photos! Now we have become golden retriever servants, but I still love labs! Thanks for sharing. Really enjoyed your dog photos and especially the Labradors; as a life long dog lover, I owned two generation of Rhodesian Ridgebacks and acquired my first ever Labrador a few years ago–truly the sweetest dogs on the face of the earth. 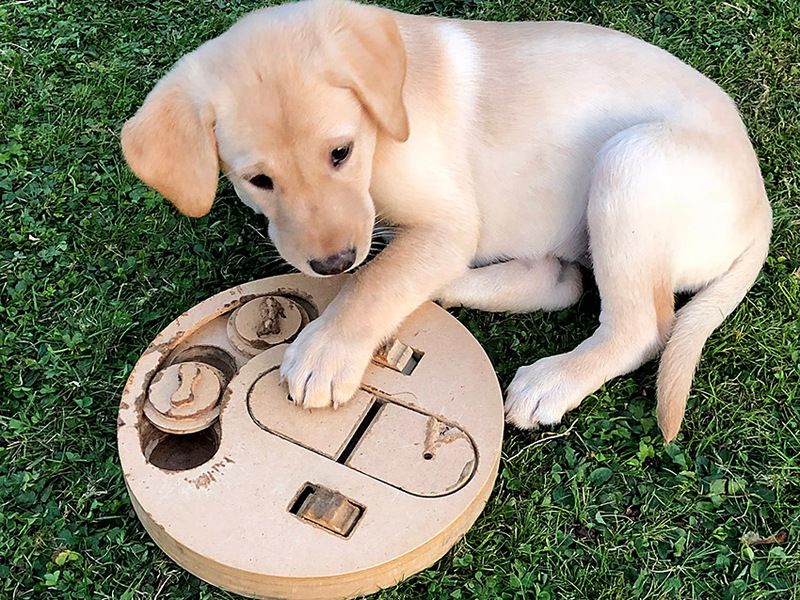 We added a young nephew to our Lab this summer but tragically he perished just a week after we brought him home–we were devastated. 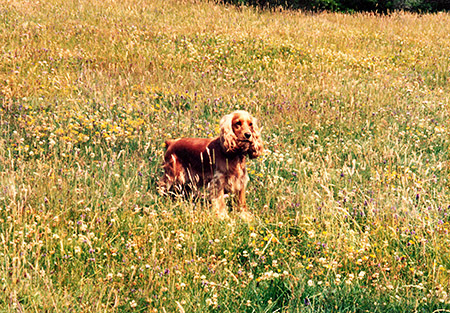 Highclere has become even more perfect after seeing your beautiful photos of the dogs! It’s my 50th next year and my Mum has purchased tickets for me to visit the castle, I have been wanting to for years so I am very excited! I hope we get to see some of the dogs running around! How lovely when are you coming? We will be there on Wednesday 17th April, it’s just over a week after my birthday but we live in Spain so we had to schedule it into a planned visit to the UK. Really looking forward to it! 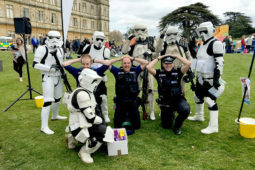 I am not an animal lover but I want to give thanks for your photos showing highclere in the background. I get such pleasure seeing you and your extended family in the lush fragrant green homestead. I’m in puppy heaven today, thanks to your blog, my friend has just got a Cocker spaniel, who is 8 weeks old, I went to visit Poppy this morning, I also have a Cocker (Max) who is so funny, and probably the laziest Cocker in the world, but we wouldn’t be without him, I’ve just finished reading a book about Finn, the police dog, that was stabbed a couple of years ago, and how he had fought his attacker, to protect his dad!! it makes you realise, just how much apart of the family, they are, and how much they are willing to give to protect you. Thank you again for sharing the wonderful photo’s. I look forward to your weekly blogs as anxiously as I await getting a letter from an old friend. I loved this week’s particularly because I too love dogs. Dogs love us unconditionally and they are always so happy to be with us. My dogs have brought many wonderful friends into my life because two strangers had something in common immediately, our dogs. What a touching post! My heart melted when I saw the puppies and your labs. The photo of you and Freya is pure magic! I am a dog lover through and through. A dog always makes a castle, a cottage or a condo feel like a home. My last puppy crossed the rainbow bridge at the ripe old age of 18, and I still think of him. We had a special bond and friendship. Thanks for sharing your wonderful animal family with readers. It warmed my heart. from cars on he adjacent fast road. I am still waiting to you to send me your actual mailing address. I have a very special gift to send you. Just loved this story. I would be lost without my dogs. Currently, we have Cecily and Sybil. Both are lab mix rescues. They brighten every hour and are the true heart of our home. Have fun and I hope to see photos. Oh, are they adorable! I love puppies. We recently adopted a German Shorthair Pointer. He is a handful for a couple of seniors like us. He still has his puppy ways even though he is nearly two years old. Every time hubby leaves the house, he comes home with a new toy it seems. Our dog Fritz, is rambunctious and adorable. I only hope he matures a little more very soon LOL. Oh, we also have a few cats who live outdoors but we feed them. One called Pig Pen(our favorite) follows hubby around like a puppy. He loves affection and watches hubby and sticks close by when he is working outdoors. I can’t imagine being without our 4 legged kids. That’ is our brood that we love, of course. Thank you for allowing us to enjoy the puppies too. I hope this video will play for you. THE most precious Mama and Pup. I have just returned from 2 weeks in England and Scotland driving with friends from Yorkshire. Everywhere I went I saw families with their dogs so lovingly cared for. Having left my rescue at home I had to have my dog fix at every stop! I shared a red velvet sofa at Barter Books in Alnwick with 4 dogs much to my delight. Upon my return, Ophelia, could smell them on my clothes. After all no outfit is complete without dog hair! I have been waiting for these pictures of the puppies since they were born. Thank you so much for posting them and they are every bit as adorable as I had imagined. The only dog I ever owned was a border collie named Mombo. He and I grew up in the country in New York and lived until we were both 14. Being a hearding dog my mother would let us three children walk to school as long as we took Mombo with us. He would stay there until noon when I got out and walk me home. Then he would go back at 3:15 and get my sister and bring her home. Finally he would trot back and get my brother at 4:00 and deliver him back to the house. Amazingly he always knew when to collect us. He became a fixture at the school and refused to leave until I appeared. He had such fun at recess and lunch time when the entire school population was let outside to play for a few minutes. His picture even made the school yearbook. Such a devoted dog. He died a hero’s death which was recounted by a neighbor who happened to witness this unfortunate accident. He called our house and unfortunately I was the one who answered the phone. Mombo only ever allowed his girl friend, a beautiful rough collie, on our property. He was crossing the country lane one day ( both dogs were 14 at this point) and she did not see or hear the garbage truck come lumbering around the corner. He did. He pushed her out of the way but did not make it himself. I could never bring myself to own another dog as I was devastated. He was the best ever. I think the last picture of you with the puppy hanging over your shoulder is definitely a keeper! What an amazing story of a truly wonderful dog – it makes me feel very humble. The photo of you and Bella just melts the heart…………..
We love to get our dogs from the local shelter. We found having at least 2 at a time is best for them and joy for us. Unfortunately they always require these pets be spayed or neutered before adopting. It’s a shame because they themselves would love to procreate as do us humans. We currently have a pair of beagles who would be the best parents. They too bring joy to everyone who sees them. So happy to see yours. Your story is touching and inspiring. Very nice picture with Bella and yourself. Freya is a beauty. We have a shihtzu who has been living with us for two years; and Charlie is the love of my life. He’s smart and very funny. We want to hold on to these living souls forever. Love reading your posts. I have two Pembroke Welch Corgi’s Sarah and Sophie. My husband and I fell in love with the breed. I figure if there good enough for the Queen there good enough for me. My corgi’s have been with me for fourteen years they stood by me when my husband died and I’d be lost without them. Love your pictures of your dogs. I feel sad that this is the very first time I have written to you. I so love reading your wonderful messages. This one in particular as I am a dog lover. At the moment I have a very shy, mistreated English Fox Hound named Kara who I love to bits! I adopted her from our local Humane Society, where I volunteer. After seeing so many unwanted dogs, it warmed my heart seeing your photos of dogs who are loved so much… Thank you! How lovely that you are going to give Kara love and in the end some confidence! Oh what a wonderful blog post, Lady Carnarvon, your dogs are all so lovely… our breed obsession is the old english mastiff. Sadly though, we lost Bailey at only four years old a few years ago. But we are finally ready to buy another puppy to brighten our home once again. I really enjoyed your blog, Lady Carnarvon! You describe Labradors perfectly. When I was a child growing up in Brooklyn, New York, and, later, Northern New Jersey in the US, we always had dogs and cats. We had two Labradors (at the same time!) – a yellow Lab named Dublin and we got him a brother, a chocolate Lab named Casey a year or two later. Their eyes told a story of love and devotion. We all still think of them 30 years later especially when I see a roast beef. Dublin was bred from show dogs and was pretty mellow, but one evening when my mother was preparing, she let the meat rest on the kitchen counter. She stepped away for just a moment. I saw a ball of yellow fur make a run for the kitchen and leap into the air and take the entire roast beef (it was meant for a family of 5). I never saw anything happen so fast and never saw anyone eat that much meat in one sitting. God love him. Of course, he could do no wrong in our eyes. We admired his agility and his attitude to seize the perfect moment. Thank you again for reminding me of Dublin and Casey with your story. I just love dogs so much, they are a big part of my life. I have a husky and I care for my sister’s toy-size poodle at the moment while she isn’t able to. I’m always happy when you tell us about yours! Those pups are just too cute and precious!!! My favorite purebred dog is the Otterhound – originating in England. I can just see Otterhounds having a lovely day exploring your beautiful grounds at the Castle! Otterhounds are lovely shaggy dogs, they would definitely enjoy the lake. Like your dear friend, Karine, would you ever consider writing a book about your dogs? My daughter works for Viking, and I now have two Finse books! 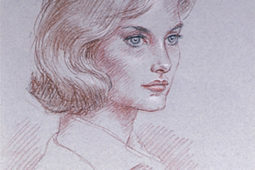 I also read your two books on former Ladies Carnarvon, and thoroughly enjoyed them both. Thank you I would love to! Hours in the day…. Just saw this post with the lovely pictures of the Labrador puppies. You talk about them diving head first into a pond. My second Springer Spaniel, Nigel, loved the water and the first time he saw a pond on a friend’s estate, he made a spectacular dive (paws pointed forward like a real Olympic diving champion) and dove into that pond. It was really funny watching him. My current black and white Springer, Darcie, would never do such a thing–she is a real princess and does not care for the water. However, she has other antics and we love her to death! Wish I could leave you a picture but don’t know how to do that on this blog. I absolutely adore these pups! My own dog, Quigley (www.travelswithquigley), is pretty much the greatest joy of my life. I’m curious, are visitors dogs allowed to stroll the grounds? 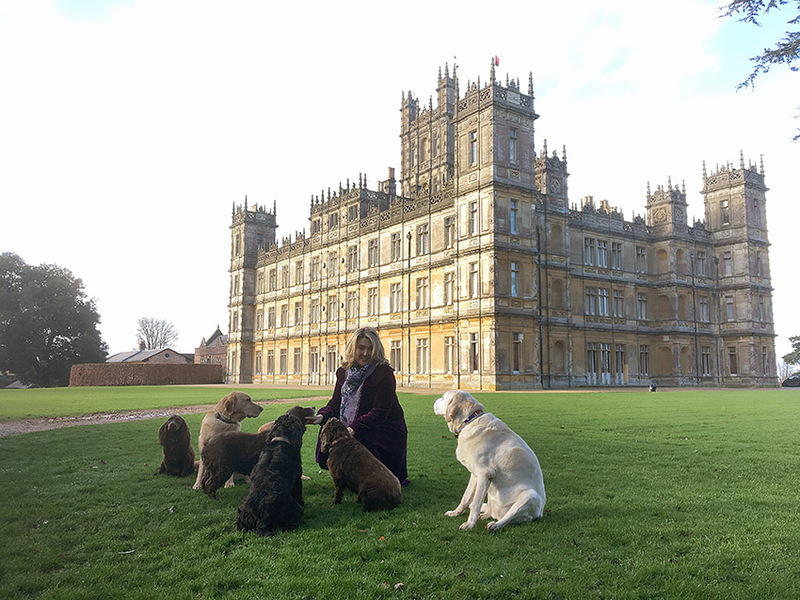 I write dog-friendly guides for a travel publication, and would love to include Highclere, if they are allowed. What a charming blog! And Quigley looks like a real character. We are not able to allow visitors dogs (with the exception of Guide Dogs) on the Park as we are a working farm with sheep, horses and wild game birds. Lady Carnavon, Labradors are the best dogs ever. We had Alex, our Yellow Lab, for ten years. He loved my husband, and the 2 of them could pass their thoughts back and forth. One funny thing he used to do is leave the room whenever my husband was angry about something. He would put his tail down, and slink away. He guarded our kitten in the driveway one time, by running in front of her when I was coming down the drive, preventing her from being run over. He would go bird hunting with my husband too, and he especially liked trips to our cottage where he could have a swim in the lake and chase the fish. Sorry to say, we had to put him to sleep after he developed nose cancer. Enjoy your puppies – they look like so much fun! They are heaven! Just put them to bed for the night.. 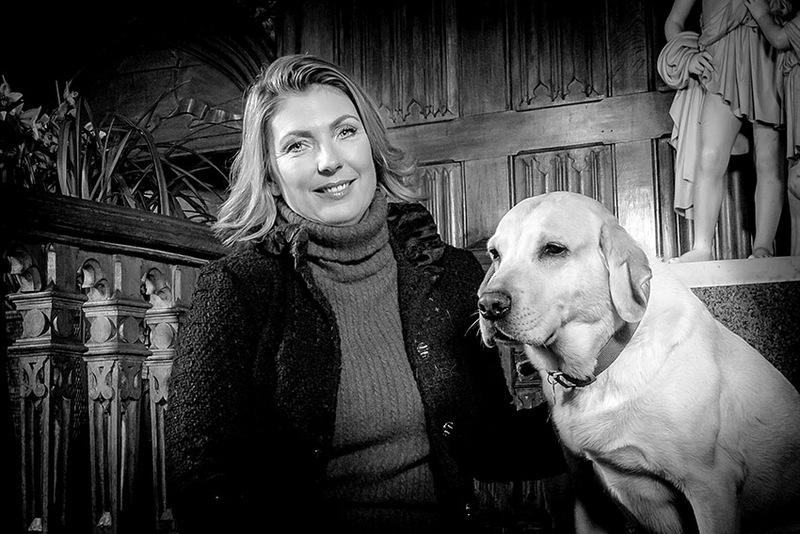 I had the pleasure of meeting and playing with Freya on my visit to Highclere on 14 November. What a little darling she is! I look forward to seeing more posts of her.